Monetary Amount: Does it Predict Response? Everyone knows by now that recency is the normally most powerful behavioral factor influencing customer response to a new offer. The people most likely to buy a new ski outfit from Sears are those who just bought something else from Sears. The people most likely to buy a new insurance policy from Prudential are those who just bought something else from Prudential. To understand the meaning of these behavioral truths, we need to recognize that we are dealing with the reactions of very small numbers of customers. Ninety eight percent (or some other huge percentage) of existing Prudential customers, when solicited, are not going to buy another policy at this time. However, of the 2% of existing customers that do buy a policy as a result of a current offer, more of them will be recent buyers than ancient buyers. That is what Recency means. It applies to catalog buyers, bank customers, business to business purchasers — every type of product and service there is. Why recency works is not generally known. One reason is the identification effect. You tend to identify yourself with a particular brand or supplier when you have invested some of your money in their products or services. You like to feel that you have made an intelligent choice. So, when you get a letter or telephone call from this company that you identify with (temporarily), you are more inclined to pay more attention (open the envelope or listen to the phone call) than you would pay to communications from some other supplier. There may also be a buying mode effect. Human nature is such that most people do not make discretionary purchases regularly week after week, but only in spurts, when they are in the mood. This is why “bounce back” works so well. Catalogers always pack another catalog in the bottom of the box when they fulfill orders. If the customer likes your dress, you may get a second response because she identifies with you or because she is still in the buying mode. This is universal. It always happens. Once you understand this fact, you can build it into your marketing tactics. You can use it in dozens of ways. One way is to decide how often to mail to different portions of your database in a six-month period. You might mail your offers three times to the top two quintiles, twice to the next two and once to the bottom quintile. Doing this will increase your profits over what you could realize from a system in which you mail an equal amount to all customers. The same principle applies to frequency. People who buy from you frequently are more likely to respond to an offer from you than people who buy very seldom from you. You can prove this in the same way. Keep track of the number of times people buy from you. Sort your database by that number and divide the database up into five equal parts. You will find that the top quintile responds much better than the next quintile, etc. Your response chart will look like the recency chart shown above, but it will be less dramatic — there will be less differences between the quintiles. Why? Because frequency, while important, is less powerful than Recency. I hope that someone reading this article will have data which will prove me wrong in some special circumstances. I would love to have someone send me some statistics that show that Frequency response rates had a steeper slope from the top quintile to the bottom than the slope of the Recency response rates. I would be delighted to learn of such a case and publicize it — together with some analysis as to why it happened. So far, no one has done this. Yes, the high spenders do respond better than the low spenders, but not by much. Why not? Why doesn’t monetary work as well as Recency and Frequency? It seems to me that there are some strong reasons why monetary is less of a predictor than the other two. Let’s imagine two buyers: a million-dollar guy and a thousand-dollar guy. Is there any reason to think that the million dollar guy (someone who spends a million dollars with your company per year) is more likely to open your envelope and read what is inside than the thousand dollar guy? I think not — in fact, I think that the million-dollar guy is less likely to open the envelope. Why? Because, as a million dollar guy, he gets a lot of mail. He is on everyone’s list, and he is used to sorting though his mail with the wastebasket at his side. We can call this the stuffed box effect. The thousand-dollar guy, on the other hand, doesn’t get so much mail. He gets one or two a day. He has the time to open them and read them. He is more likely to open your envelope than the million-dollar guy. That is a fact. However, once the envelope is open, then there is a big difference. The million-dollar guy is probably in a position to write out a check for whatever you are promoting in your envelope. The thousand-dollar guy, on the other hand, may have to think long and hard about it. If the item is too expensive, he will have to turn it down. This income effect, therefore should be pushing your response rates in the right direction (high quintiles respond better). 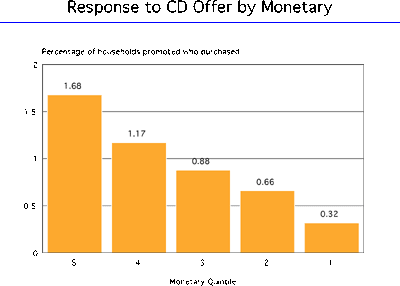 You can test and illustrate the workings of the income effect by looking at the response rates of monetary quintiles to a high dollar promotion. I worked with a large bank that mailed a 250,000 offer for CD’s every April. The minimum price for a CD in this offer was $5,000. The graph of the monetary quintile response rates showed a clear predictive pattern which was almost as dramatic as the recency graph. 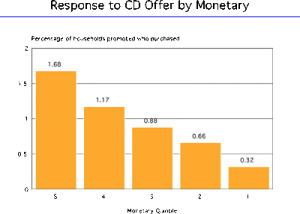 What this means is that monetary quintiles can be useful in predicting response rates only in high dollar situations, where the amount to be spent is significant. Most people have not thought much about this. They assume that monetary amount is a good general predictor of performance, just like recency and frequency. It isn’t. Here again, perhaps I am not right. Perhaps a reader has an actual case history of a low-dollar promotion where monetary spending levels accurately predicted responders. If so, I would love to hear about it. At the Database Marketing Institute we have developed software that codes customer databases by monetary and the other behavioral factors. It is called RFM for Windows. The charts shown in this article come from promotions made in customer databases coded with this software. For information, you could call the Institute at 954-767-4558. Arthur Middleton Hughes is Vice President of The Database Marketing Institute that does research and consulting for e-mail and database marketing companies. He would love to hear about your problems. Perhaps he could help. He can be reached at Arthur.hughes@dbmarketing.com or 954 767 4558. 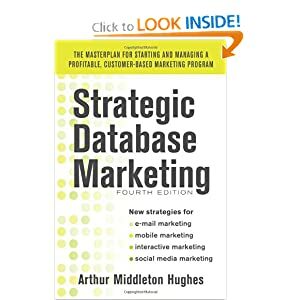 His new book Strategic Database Marketing 4th Edition is due out from McGraw-Hill in 2011.